I'm a little late on the draw, but here's my post about my brother's visit. Yes, my sister's still here, so I'll have to do another, possibly longer, post about her visit, but I figured I should at least go chronologically. Nathan came to visit with his friend Dan. They were here for a few days and then headed to the Mainland to see Guilin. It's where Avatar was filmed, and it's supposed to be the most beautiful place in the world. They got in on Friday night (I think? ), and the next day was a public holiday, so I didn't have to work! In fact, for Easter holiday I had Friday, Saturday and Monday off! It was pretty glorious. We kicked off their visit by wandering around Aberdeen on Saturday morning, of course riding the sampan (ferry) across. We walked through the Aberdeen wet market, which was pretty neat. There are SO many kinds of fish! 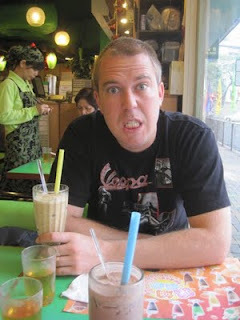 After that we went to a restaurant called Greenland for specialty milk teas. You can probably guess why I like a place called Greenland! Fish and clams (oysters?) at the wet market. See why I like it? Of course, the bows make it look more like Christmasland. 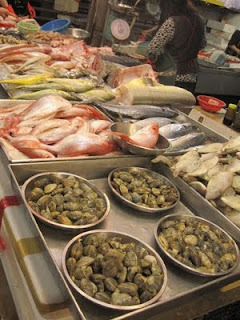 After that, we met up with Mom and Dad and went to the Jumbo for a dim sum lunch. The Jumbo is a famous floating restaurant next to our house. I pass it every time I go to Hong Kong island (which is usually several times a day), but I'd never eaten there (it's expensive). We decided since Nathan and Dan were here, we should finally try it. It ended up being an interesting experience. It was very fancy, but the dim sum was SO STRANGE! We ordered spring rolls, and they had cream cheese and mango in them! Weird! I tried ordering something normal like shrimp dumplings (har gow) but it was $60 for three! Apparently it had gold flakes on it. Who puts gold flakes on shrimp dumplings anyway? Seriously, have you ever seen cream cheese in a spring roll? At least they had some normal things like chicken feet. After our interesting experience, we met up with one of mom's friends. She has a car and was showing two other guys around town and invited us along. 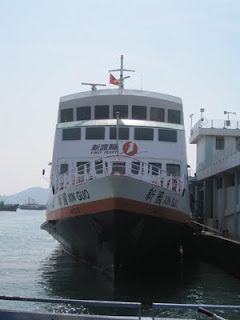 She took us to Deep Water Bay and then Stanley where we wandered for awhile, and then over to the Tai Tam reservoir. It was pretty cool. Then we ate dinner at MX, a Chinese fast food place (which the guys loved), and rushed over to TST to watch the light show. Fun times. Deep Water Bay. It's a pretty ritzy place. All of us (minus Dad) at Tai Tam. Dan taking pictures at the light show. The next day we went to Mom and Dad's church for Easter. After the service, we rushed off to Cheung Chau for the day. I think everybody and their mother had the same idea, because I've never seen crowds like this! The weather had started heating up and it was really humid. I was wearing jeans and felt pretty miserable. I had to will my legs to walk. We ended up going to the "pirate cave" where a historic pirate used to hid his treasure. Once again, everybody and their mother had the same idea, so we ended up waiting almost two hours to get into the cave, and it took less than five minutes to get through the cave. Oh well. After riding the ferry back to Hong Kong Island, the guys and I took a bus up to the Peak to take some pictures. I was pretty tired at that point, and we were all ready for bed, so we scurried back home after taking a few pictures. 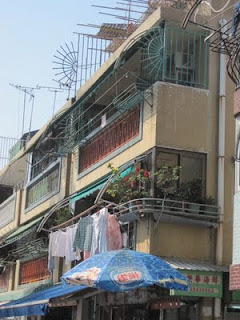 They have all sorts of cool balconies on Cheung Chau. 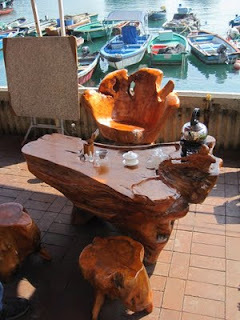 I really liked this tea table and chairs. It has a great harbor view as well. They were practicing for the upcoming bun festival. 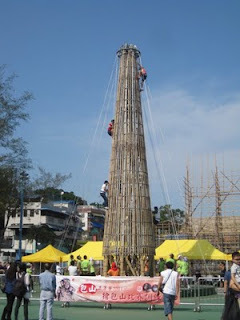 During the festival, the tower is totally covered in buns, and climbers have to make it up the tower and collect a lot of buns. Or something like that. The beach was crowded too. The night view from the Peak. We did something on Monday, but I don't remember what. I think they went to look at computer stuff. On Tuesday, we went to Maxim's Palace at City Hall. 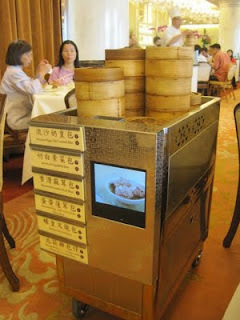 It's one of the few traditional dim sum places left, where workers push carts of food around and you order off of the carts. I was excited for two reasons. First, it was real dim sum! Second, I could order easily! You just have to point and don't have to worry about the names of everything! It was SO good. After eating, the guys headed off to Avatar-land. Traditional push-carts. Of course, not too traditional, since it has a tv on it. One of my favorites: Shanghainese soup dumplings! Whatever you do, don't bite into them directly. Vegetables. We try to be healthy. Another favorite: sesame balls filled with either red bean or lotus paste. They got back from China on Friday, and that night we went out to dessert. I forgot to take pictures of that, so oh well. On Saturday, I had to work all day, but we met up for dinner after work. My friends Lillian and Josh were able to join us, and we all went to an Indian restaurant. Hooray for Indian food! After stuffing our faces, they hurried off to the airport to go home. Thanks for coming, guys! It was pretty fun. Taking pictures of our Indian food. We were drinking mango lassies. Lillian and Josh joined us for dinner. We were pretty full by the end. So doesn't this make you want to come visit too? those Shanghainese soup dumplings look really good!